A pregnant woman must be critical of everything she consumes during pregnancy, because her unborn baby can absorb harmful substances through her body. It can be difficult to determine the safety of many items, especially natural substances that may not have been the focus of any studies or evaluations. Turmeric is considered safe for a pregnant woman when used to season foods, according to the University of Maryland Medical Center. Ask your doctor before consuming anything that you are not sure about if you are pregnant. 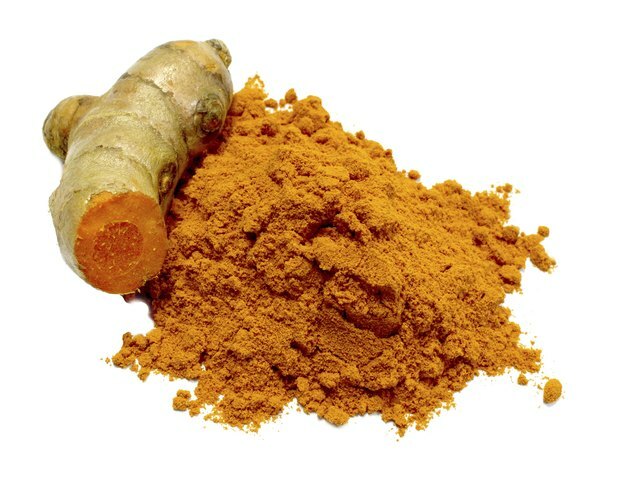 Turmeric, also known as curcuma longa, is a plant that grows primarily in India. The plant’s roots are used in medicines and in food, and supplements can be found in the form of powder, extract or capsules. Turmeric and products made with it can be found in grocery and health food stores, and if it is consumed in high doses or over a long period of time, it can cause heartburn and upset stomach. Turmeric is used as a type of food coloring, and can often be found in mustard, butter and cheeses. It is also used in curry, a popular Indian spice, and other various spices. Turmeric powder can also be stirred with hot water to make tea. According to Medline Plus, turmeric is used in traditional Asian medicine. It has been used to treat digestive problems and its anti-inflammatory properties make it useful to treating wounds and relieving symptoms of arthritis. For a pregnant woman experiencing digestion difficulties, turmeric may seem to be an attractive natural remedy. According to Medline Plus, no animal studies have found turmeric to cause abnormal development in a fetus, so it is not likely that a pregnant woman’s baby could have birth defects from the mother’s turmeric consumption. However, Medline Plus states that turmeric can cause stimulation of the uterus, which can lead to contracting and menstrual flow. Uterine stimulation can be dangerous during pregnancy, especially before reaching full term gestation at 37 weeks. The University of Maryland Medical Center states that turmeric is safe for a pregnant women to consume, but only when used as a spice to season foods. It is not safe to take turmeric as a supplement or use it as a type of alternative medicine during pregnancy. If you are allergic to turmeric, you should avoid it during pregnancy.